With the beginning of show season comes an annual ritual that many equestrians dread: digging out the show clothes and trying them on. If they don’t quite fit anymore, are a bit worn out or are starting to look dated, now is the time to work on a new show wardrobe. 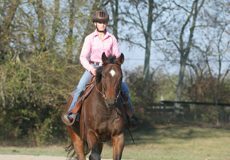 The good news is that riding attire is better than ever, so if you haven’t upgraded your show outfit in a while, you’ll be pleasantly surprised by what’s available. 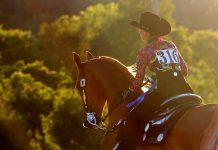 Manufacturers are now treating equestrians like athletes and bringing new, technological fabrics into show attire. Approved safety helmets are becoming more and more widespread, and with that increased usage comes a wider variety of styles. 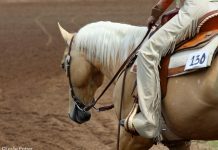 With the current economic climate, the “bling” trend of recent years has toned down a bit, though western riders can still find plenty of decorative accents for their show shirts. Watch our 2009 Show Ring Fashion slideshow to see what’s hot this season, and read Show Clothes Splurge or Steal for ideas on how to shop smart for riding attire. Next articleShow Clothes Splurge or Steal? Can’t view your Show Ring Fashion slideshow! There’s blank space below your copy. the ladies were tall and all i seen was frog legs. what happened to duade skirts etc. plus,where is any fashions for the horses after all it is all about them. I LOVE this mini fashion show. It gives me a great idea of what the latest trends are. I will be making a purchase as a result of this. Great job. some mention of availability in tall or at least larger sizes would be essential to inspire me to purchase. I don’t have a willowy model’s figure any more and I have been caught more than once with the extra large I ordered being more like a medium and too tight or too short for comfort.